Western Whiskey Gazette (WWG): Countdown to Auburn! Coming soon, to a Gold Country near you! The 'Best of the West' bottle display this year at the 49er Antique Bottle Show in Auburn, CA will feature ROXENBAUMS and CUNDURANGO bitters bottles. 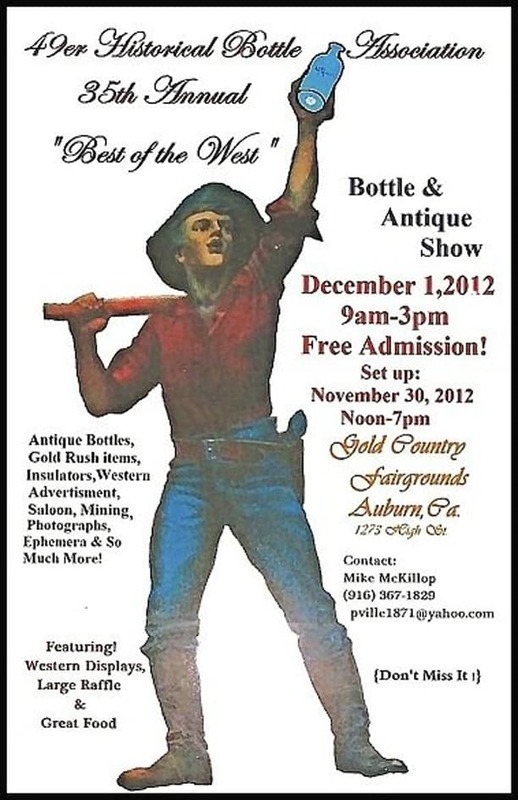 All collectors/dealers/diggers are encouraged to display their examples of these bottles. A large back-lit cabinet with locking glass doors will be provided to exhibit these wonderful bottles. This is not a judged event and we have capacity for approximately 55 bottles! Please join other collectors in displaying as many examples as we can. See Warren Friedrich or Mike McKillop. Thanks.